Above cars shown with std. RRR #819 wheels & tires. 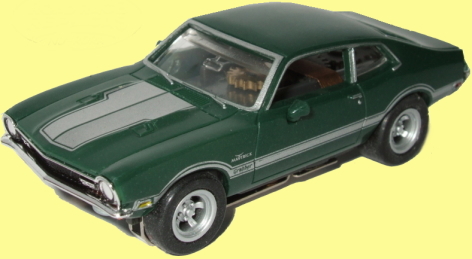 This car is a highly detailed replica of the 1970's FORD MAVERICK GRABBER. This car is injection molded high-impact plastic and has a high gloss finish. The painted hood & side stripe has great definition along with nearly 30 pad prints! This beautiful car has all the details! It has Grabber hood scoops, side mirrors, side marker lights, chrome plated and detailed painted bumpers - it even has license plate details. Rear view mirror is molded into clear windshield. Front grill has fog lights and pad printed black outline! Tail panel is painted black and has multi-colored tail lights. Chassis is customer supplied Thunder-jet. Awesome little car. 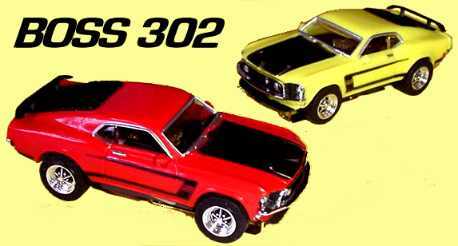 These are made to match the factory Ford colors available at the time. ABOVE 6 COLORS NOW SOLD OUT! Just recently added is the new IVY GREEN Grabber (below) - it has metallic molded into the plastic! Currently Available in 2 colors! GRABBER GREEN - SOLD OUT! 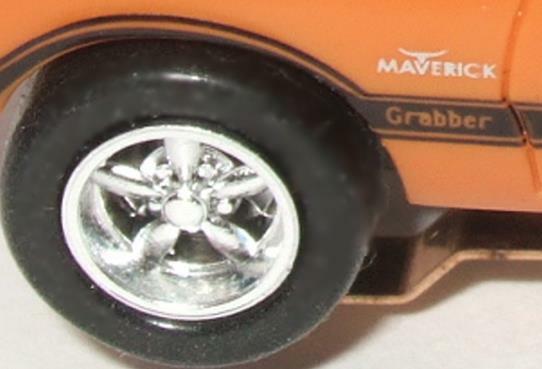 GRABBER ORANGE - SOLD OUT! CALYPSO CORAL ORANGE - SOLD OUT! CANDY APPLE RED - SOLD OUT! BRIGHT YELLOW - SOLD OUT! METALLIC IVY GREEN w/SILVER - SOLD OUT! 100 Car LIMITED EDITIONS - NOW AVAILABLE!!! 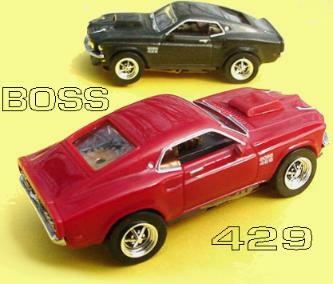 Click for details on our #4041 DRAG MAVERICK KITS and DECALS!